On Wednesday, December 10, 2008, JRRN hosted the Second JRRN Mini-seminar on River Environments, “The Restoration of Urban Rivers Including the Anyang River” (with lecturer Dr. Lee Samhee, KICT researcher). The lecture, which was about the current situation of river restoration in Korea as well as technical methods and issues, focused on a case study of the Anyang River. In addition, there was an active exchange of opinions with participants. 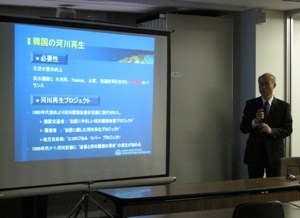 In the lecture, Dr. Lee briefly introduced some approaches towards river restoration in Korea. Then, taking up the Anyang River, which is famous as a successful case of urban river restoration, he explained the outline of the restoration project, applied technologies, the current situation of ecological recovery, and participation by citizens. There was also a one-hour exchange of opinions after the lecture. 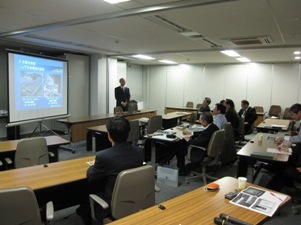 During that time, participants discussed the differences between characteristics of rivers and the legal systems of Japan and Korea, the importance of the presence of leaders in a project, and relationships among governments, citizens and business organizations in the management of river environments in Korea. This gave a precious opportunity for them to understand similarities and differences between Korea and Japan.